While I couldn’t ignore the sizes on my clothes getting larger, I felt a balance of denial and excuses. I spent a lot of time feeling sorry for myself, as it seemed like my friends could eat salami sandwiches on white bread with mayonnaise and weigh 108 lbs. I blamed a bad metabolism, my hypo-active thyroid that I had been diagnosed with at age 19, genetics and anything else I could think of. It was a balance of self-pity, self-disgust and just downright disbelief. I have gone from 208 lbs. to 117-119 lbs. and I tell people I have no gauge at all. I look at my own “before” pictures, and while I knew I was getting heavier, I never felt THAT fat. You have an image in your head of what you look like, and for me it took a day at the spa to face the reality, that I no longer resembled my former self. It occurred to me that I was a spectator. I would watch TV, watch a movie, read a book, go see a sporting event or theatre performance, everything involved watching or reading about other people doing something. Going out to eat had somehow become something to DO. I used to go for bike rides with friends, have a weekly racquetball game, take a dance lesson, all of which, one by one, had just sort of stopped as I got older. I was watching life go by, while I sat on the sidelines. The next day launched my all out attack on fat, and THIS time, I meant business! I began working out with home workout videos, and found a great personal trainer. I found weight training, like some people find religion, as it was that life changing to me. Any other times I had tried to work fitness into my life, I had only tried cardio, and since you can’t outrun the fork, made little progress. I went grocery shopping to stock up on some healthier food options. I try to eat lean proteins (chicken breast, fish, bison), complex carbs (steal cut oatmeal, brown rice), green veggies (kale, salads, & broccoli), and healthy fat choices (avocado & salmon). I try to encourage others by being very open about my experience, and my weight loss led to being featured as success story in Good Housekeeping Magazine. After I lost the weight, a few girl friends messaged me on facebook asking me how I did it, and I began giving them advice on what worked for me. I began commenting if they’d check in at restaurants, about what they were ordering, or they’d text me and ask me what to order. I would try to encourage them to bust any excuses why they couldn’t work out. 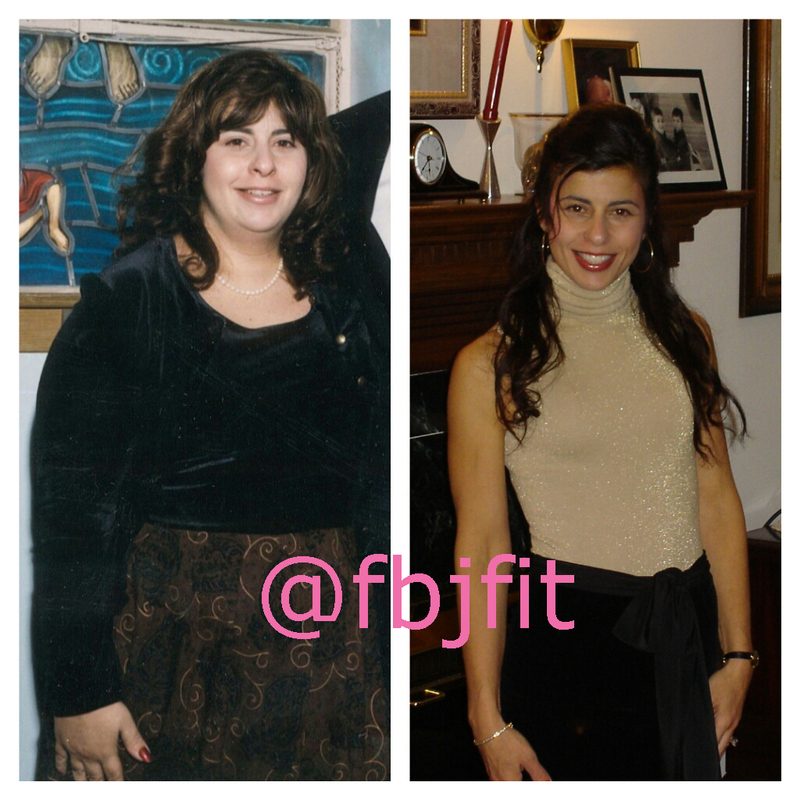 As they began losing weight, several of their friends started messaging me as well, and I created a Facebook page dedicated to giving diet/fitness tips, sharing healthy recipes and overall fitness inspiration on my FBJFit facebook page (https://bitly.com/FBJFit). I know my journey has encouraged a lot of people, so that I try to live up to it by continuing to make the right choices. I think having been on both sides of the spectrum gives me an appreciation for the struggles of one trying to lose weight, and the work and effort put into a fit person. I think everyone has a vision of where they want to be physically and mentally, but getting there can be a complicated road. Through social media, without any sort of judgment and by using nurturing but firm advice, I try to help others set a strategic plan for achieving their own fitness goals. I feel tremendous joy in coaching others by sharing information and encouragement that I wish I had available to me when I began my own journey. I try to use this persona to be a champion for living out loud. I’ve learned many lessons the hard way and from repeated failures, but I’m thrilled that I’m no longer on the sidelines of life! 1. Remind yourself, “You’re no busier than a fit person.” We’re all busy. 2. Make your workouts like “brushing your teeth,” something you just do without question. 3. Always plan: Keep a Luna in your pocketbook for emergencies, check the menus online before heading out to a restaurant, bring a healthy treat you enjoy when attending a party. 4. As a general rule, unless it’s cauliflower or White Chocolate Luna bar, if it’s white, don’t eat it. 5. Think of food as a choice, and not as a reward or a punishment. You don’t “deserve” a decadent dessert, nor are you “depriving” yourself if you don’t have it. 8. Recognize the saboteurs. You’ll need to be able to resist the “just this once,” “just a taste or bite won’t hurt you,” and even the “you’re no fun anymore” from some of the people closest to you. 10. Eat foods in their lowest common denominator: Think orange, not orange juice, and shop the outside aisles of the supermarket; it’s where the least processed foods are. Keep it real, keep it raw. Be RARAx3. Thanks Charlene for starting a blog; I’m looking forward to learning much more from you. Kath ?? ?